To celebrate the inaugural NI Science Festival, FabLab NI in both Derry and Belfast are running a series of workshops and training sessions allowing people of all ages and from all backgrounds to get involved in the fantastic ten day long festival, aiming to inspire and teach them about the importance of science in our lives. Taking place throughout the festival, FabLab at the Nerve Centre will offer teachers and students across the Key Stages the opportunity to take part in the Creating STEAM sessions. These practical sessions will be delivered using creative digital technologies, encouraging learning in STEM areas using the arts and creativity as a hook. These workshops will look at themes such as the Science of Animation, the Science of Music and the Science of Creative Code. On Saturday 21st February, FabLab Belfast will be bringing a pop up FabLab to the Black Box for a Maker Day, designing, hacking, gluing, printing, cutting, milling and fixing for all the family! Using our 3D printers participants will be allowed to create replicas of their own head, laser cut their own NI Science festival memento or get into electronics and learn how to solder. We’ll also demonstrate how FabLabs are designing and making weird and wonderful things from key rings, to electric cars, furniture and even fully formed houses! 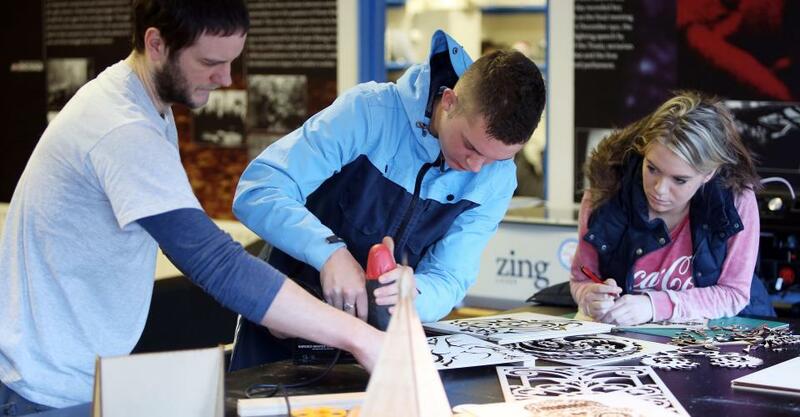 Also on offer at both labs as part of the festival will be Maker Taster Sessions. Open to families, groups or individuals who may be looking for a new activity that they can learn and participate in. We welcome everyone along between 10AM and 4PM on Friday 20th in Belfast and 10AM and 1PM on Saturday 21st in Derry, to design and make a variety of things using the latest in digital fabrication technologies and good old fashioned creativity.